I may have mentioned before how much I’ve enjoyed those audio commentaries on the Looney Tunes Collections. The affection these animation experts communicate for their subject is an unending pleasure to listen to. Would that we all could have some one thing in life to embrace with such uninhibited enthusiasm. You get a whole new perspective on the cartoons, as well as a glimpse into the colorful personalities of the folks who talk about them. I particularly like the tag team commentaries. All these narrators grew up on Warner shorts, and there’s not a stone left unturned in their often light-hearted and always informative tracks. Porky In The North Woods was one of Mark Kausler’s contributions, and I found it particularly affecting. He’s an animator who’s written cartoon history since the sixties, a leading authority in the field. Toward the end of the cartoon, as another great Cal Stalling theme swells up for the finish, Kausler’s narrative voice breaks. Gosh, I can’t listen to this music without tearing up. I’m sorry, I love this music so much. He signs off with a recommendation that we watch the short again without his commentary, but I wouldn’t have missed this moment for the world. It was an honest, heartfelt, and undisguised expression of what we all feel for these wonderful cartoons, and I don’t know that I’ve ever heard it better conveyed than by Kausler. The emotion of this moment alone was worth the price of the DVD, but of course, there are fifty-nine other shorts here as well, plus voluminous extras. 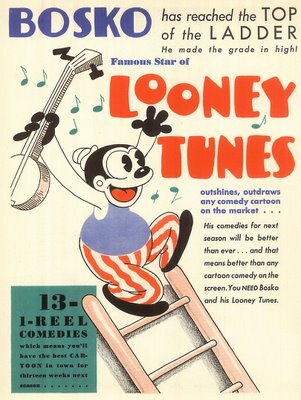 For my money, these Looney Tune Collections are the bargain of the century, and certainly the event of each year a new volume arrives (four of them so far).